The University of California San Diego has been named the nation’s 10th best public university for LGBTQ students, according to BestColleges.com. The new rankings measure academic institutions that create environments and policies which meet the needs of students with a wide range of gender and sexual identities, along with additional academic and affordability metrics. According to BestColleges.com, LGBTQ is not a comprehensive acronym. Students looking for resources will likely come across many other abbreviations, since gender and sexuality fall across spectrums rather than set categories. Other examples include pansexual (P), gender non-conforming (GNC), and queer (Q). Acronyms aside, most LGBTQ campus resources try to serve as an umbrella resource for many identities. The rankings looked at unique campus resources that provide support to students of various gender and sexual identities. LGBTQ community life thrives at UC San Diego, from student organizations like the Queer and Trans People of Color (QTPOC), to university-wide academic organizations like oSTEM, which serves the out LGBTQ student population in science, technology, engineering and math. In addition, the campus is home to the LGBT Resource Center, one of six campus community centers under the leadership of the campus’s Office of the Vice Chancellor for Equity, Diversity, and Inclusion. The LGBT Resource Center is open to all members of the university community to explore issues relating to sexual and gender identities, practices and politics. 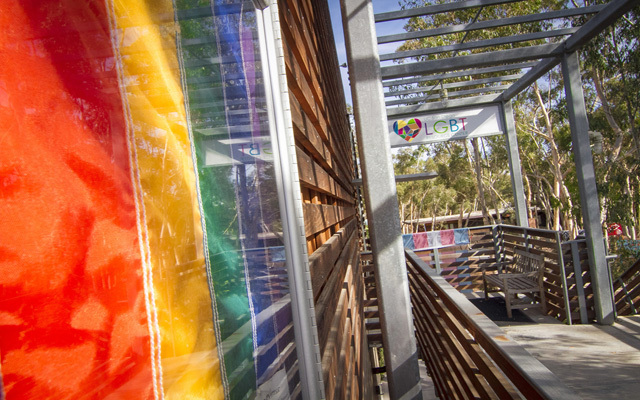 “UC San Diego continues to be a vital place for LGBTQIA+ students, especially around transgender, nonbinary and gender queer identities,” said Shaun Travers, campus diversity officer and director of the UC San Diego LGBT Resource Center. Travers added, the campus’s LGBT Resource Center develops student leadership, builds workplace equity, promotes academic research and provides resources. The center challenges existing definitions of variant genders and sexualities by engaging in community building both on and off campus. Among both private and public colleges, UC San Diego was ranked the 25th best for LGBTQ students in the U.S.
For more information on the to BestColleges.com list, click here.